Charleston police released surveillance images Tuesday of two people wanted in a string of wallet and purse thefts in downtown Charleston. | Crime Stoppers of the Lowcountry: 554-1111 | 1-888-CRIME-SC | Anonymous tips earn cash rewards with Crime Stoppers of the Lowcountry. Home | News | Charleston police released surveillance images Tuesday of two people wanted in a string of wallet and purse thefts in downtown Charleston. Charleston police released surveillance images Tuesday of two people wanted in a string of wallet and purse thefts in downtown Charleston. The incidents occurred at three businesses in the 200, 300 and 400 blocks of King Street, according to Charleston Police spokesman Charles Francis. The three incidents all occurred on Friday and were reported at 5:29 p.m., 6:13 p.m., and at 7:11 p.m. According to an incident report of the third incident, a store employee was preparing to close for the evening and had placed her purse on a sofa near the entrance to the business. A woman entered the store and began talking to the employee, asking for help to find a gift for her daughter, the report states. A man then entered the store and asked about prices of several items at the rear of the store, which the employee found odd since the items were "clearly listed on the tags," the report states. The employee told police she then returned to her purse and found her wallet missing and said the man left the store while she looked for it. Surveillance video showed the woman reaching into the victim's purse, the report states. 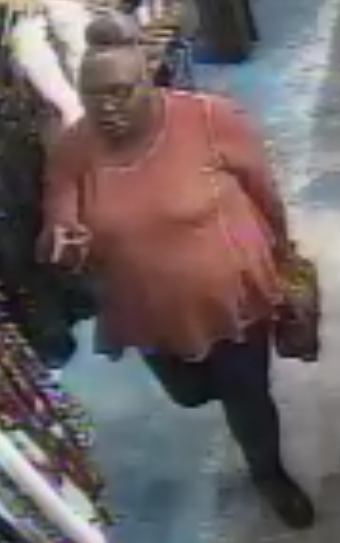 Police say the first subject is a heavy-set woman appearing in her 50s with gray hair pulled into a tight bun. She was seen wearing a long orange shirt over black leggings and black shoes. The second subject is a thin-build man who appeared to be in his late 20s with dreads pulled into a loose bun with a cream-colored Ralph Lauren Polo baseball hat, black or navy half zip sweater over a white collared shirt, khaki pants and light brown leather shoes, police say. If you wish to remain anonymous and want to get cash for information that leads to an arrest call Crime Stoppers of the Lowcountry at 554-1111. Anyone with information about them is asked to contact Investigator E. Wolfsen at 843-720-3913 or wolfsene@charleston-sc.gov.